By E. B. (Kansas) – In this sequel to Heidi Thomas’ first novel, Cowgirl Dreams, we find Nettie married to her cowboy, Jake Moser, and living the dream life. A loving husband who encourages her love of rodeo, she’s a bull rider, she is invited by her mentor and friend, Marie, a successful rodeo rider to compete in a wild west rodeo in London. But as fate would have it, Nettie finds she is pregnant and her dream is put on hold. Set in Montana in the days of the Depression when the rains stopped and the land dried up. To save the horses they are raising, the couple drive the herd from place to place looking for greener pastures. The years go by and Nettie and Jake and their son Neil, pretty much live on the road with occasional stays in various towns so Neil can attend school. This is a story of one dream unfulfilled, but carries the lesson that life evolves all the time and although dreams often die, love and hope and commitment can create a different kind of dream and that dream may be the best dream of all. The story is based on the life of the author’s grandmother. I won this book on Blog Jog Day, so I must thank Carol Denbow for organizing that event. It allowed me to discover plenty of interesting blogs AND allowed me to win something – and trust me, that’s not something that happened often in my life! Even if I hadn’t won it, I had already put Cowgirl Dreams on the to-buy list, as I was intrigued by this story inspired by the author’s grandmother. I’m not American and always had a preference for Indians against cowboys, but this is the story of a cowgirl. Add to that I have just visited Montana (a month ago), met a true Montana gentleman (his lands have been in his family since the late 1800s, and he had to give up some for a Cheyenne reservation) and watched wild mustangs, so it was almost like being on vacation again. This story is engrossing, funny and tragic like real fife. I rooted for the 1902s cowgirl coming of age, who only wanted to ride and be a rodeo queen even if I’m a city girl who never mounted a horse in her life. I still could relate to her dream, held my breath at her decisions and mistakes and everything life in a tougher century (especially for women) brought her. I’ll admit tears came to my eyes here and there as well. I recommend this book to anyone (male or female), especially young people with a dream of any sort. Enjoy the happy ending of this reality-based fairy tale and Heidi M.Thomas’s great writing style – this lady can definitely tell a good story, I should take lessons from her! She was kind enough to answer some of my questions, so you’ll read her interview next week on this very same blog, so don’t forget to come back. If you enjoy reading a good western/historical novel, you won’t want to miss reading Cowgirl Dreams by Heidi M. Thomas. Based on the author’s grandmother, this book captured me from the very first page and I couldn’t put it down. Cowgirl Dreams had my heart in my throat. Not many books can make me cry, but this one sure did. This novel has earned a place on my bookshelf and I highly recommend it. I’m sure you will enjoy the read. I look forward to seeing more by this author. REVIEWED BY MINI MAGOONettie Brady is the ultimate tomboy. She yearns to change her long, ladylike skirts to denim pants, and would much rather ride horses and compete in rodeos than be doing the sewing and darning that her mother makes her do at home. Competing in rodeos is Nettie’s dream, but the time is the 1920’s, and such activities aren’t deemed acceptable for a woman. However, even though her own mother wants her to be ladylike, Nettie often sneaks away to dances and horse rides. Although she’s determined to accomplish her dream, Nettie also has to deal with a flood, influenza, and even some broken bones! On the other hand, she does get to meet her personal heroine, a famous cowgirl. Then she meets a neighbor who is funny, handsome, and everything Nettie could want. Is she just having silly thoughts, or is a romance starting to blossom? It takes Heidi M. Thomas only a couple of chapters to completely hook her readers. Due to the constant excitement and frequent surprises, I couldn’t put the book down from almost the very beginning! Thomas also excelled in her character description, and I was always able to relate to Nettie. Young readers between ten and fifteen years old will love this novel! Cowgirl Dreams by Heidi M. Thomas is a keeper! I loved this book because the voice of the protagonist was so real! 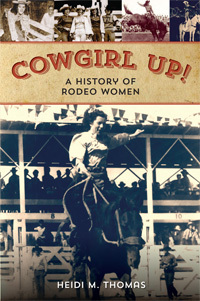 Probably because it was based on the author’s grandmother, a Montana cowgirl who actually rode steers in rodeos. This book reminded me of the Little House on the Prairie series. Nettie, like those strong-willed girls who knew what they wanted, went after her dreams with determination and spirit. 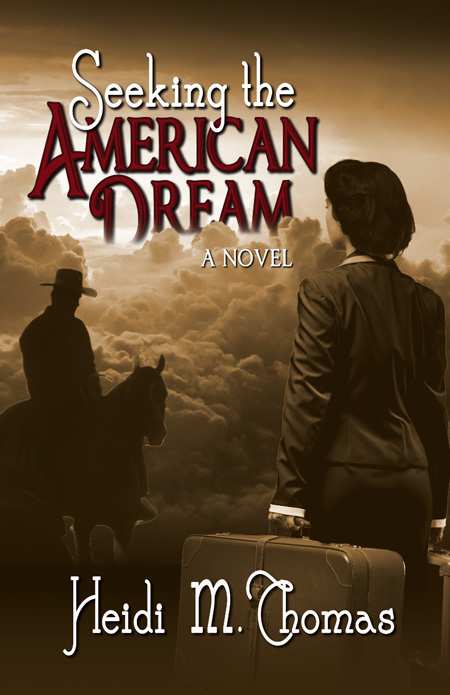 Set in the 1920’s in Montana, Nettie often rides and enters rodeos behind her parent’s backs and against their wishes. Her dream is to be a rodeo star – despite the reputation that she may earn or any of the broken bones she may accumulate. She tries to be a good daughter, especially after a family tragedy, but the rodeo life is only put on the back burning for a little while. When she meets a handsome cowboy who also loves the rodeos and everything about horses, Nettie learns that her dream doesn’t have to be extinguished, just shared. Finished your book in record time for me….1 week, and loved it. Couldn’t put it down, even after my favorite programs came on the tube. Don’t know whether to congratulate you or me, as it’s the first I’ve read, cover to cover, in about 10 years. My brother, who hasn’t read a book in 20 years is now half way through it. Maybe you’ll be the one who gets people, in this day and age, reading again and I can brag that I know that author. Rodeo is not a place for young ladies—at least that’s what Mama believed. Young Nettie would just have to find a way to show her otherwise. Steer riding wasn’t just a dream for this fourteen-year-old, it was in her blood. Wearing her brother’s denims, Nettie Brady rides her first steer. From this moment on, she fights to keep her dream alive as the Brady family live their lives in 1920s Montana. The future brings hardships and disappointments for the Bradys but in the end, love prevails. Heidi Thomas writes a novel based on her own grandmother’s life. Depicting the hardships both inside the arena and out, Ms. Thomas tells a tale about a part of rodeo history not many know about, bringing to light some of rodeo history’s most famous women. This heartwarming story follows the strong, independent Nettie as she finds her place in a world that is dominated by men and tries to balance it with her family life. 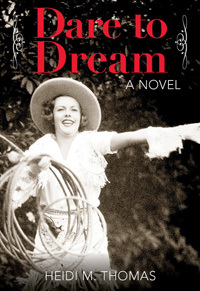 Cowgirl Dreams was a quick and enjoyable read. The story line had some unexpected twists and turns that made the Brady family very endearing. While this is a great read for all ages, I would strongly recommend it for young teens. It is a wonderful YA (Young Adult) book! For the duration of the story you are completely immersed into the world of growing up in Montana in 1920s. Hard work on a family ranch, dreams that defy conventional wisdom, hard choices and, finally, success. Try becoming a rodeo star, when rodeo circuit is a man’s world and you are a teenage girl! I appreciated author’s meticulous research. All the details of everyday life on a ranch, food, clothes, and people’s mindsets were so interesting…more It is a wonderful YA (Young Adult) book! For the duration of the story you are completely immersed into the world of growing up in Montana in 1920s. Hard work on a family ranch, dreams that defy conventional wisdom, hard choices and, finally, success. Try becoming a rodeo star, when rodeo circuit is a man’s world and you are a teenage girl! I appreciated author’s meticulous research. All the details of everyday life on a ranch, food, clothes, and people’s mindsets were so interesting, true and well placed throughout the story; I could not help but admire it! If you are a fan of “Little Women”, “Secret Garden”, “Little House on the Prairie” and “Ann of Green Gables”, take a note of this author, she is the one for you. I would say the book is a great coming of age story with a lesson in history, lots of adventures, a touch of romance and a great lesson in perseverance. I am buying this one for my daughter. 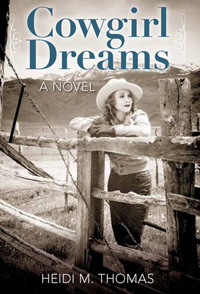 Heidi Thomas’s Cowgirl Dreams provided me with a delightfully engrossing pleasure: a “good read.” An added bonus was a bit of history detailing the hardships and delights of rural life in early twentieth century Montana and the expectations for women of the time. I approached the tale with a mixture of mild trepidation and hesitant curiosity, the twin themes not being typical fodder for my pleasure reading, and finished with the great satisfaction found in experiencing a well-told story. Nettie Brady’s adventure richly details a pair of transitions: a child growing into young adulthood and a women tackling roles previously claimed by the men of her times. This is a book for all ages, and I look forward to the possibility of reading further installments of Nettie’s life and times. and properly care for the family that she will inevitably have one day. of being outside, where she’s happiest. wonders if girls will ever get a chance to fully prove themselves. understand that what she wants for Nettie is not necessarily what Nettie wants for herself? series about the independent women of Montana. “Cowgirl Dreams” by Heidi M. Thomas is an adventurous novel. The main character, Nettie, aspires to be a rodeo star. She abhors domesticity and yearns to be more than just a housewife someday. Nettie gets involved in altercations as her mother is against her participating in rodeos. Still, she finds a way to ride and even meets famous female riders. The descriptions of western life in the 1920s are fabulous, and readers will root for the Nettie.The book starts out with action, leads to drama, goes back to action, and then delves into romance. Kissing is mentioned, and consummating a marriage is included. There are no details, but readers get the gist. Vocabulary-wise, readers may have to look up five verbose words at the most and a couple of horse equipment terms. While anyone could read this book, it will probably be more enjoyed by female readers. Subtle romance. Nettie Brady who is fifteen years old sets out to pursue her dream, regardless of family opposition, and strict standards of society in the 1920s. She is determined to fight all obstacles that cross her path, including weather, and finances. Nettie finds the courage to replace skirts with pants, while protesting that a women’s place doesn’t have to be in the kitchen, barefoot, and pregnant. She begins to venture out into Montana’s male territory to prove that she could be a rodeo champion and anything else she wants to be, despite ugly rumors of a bad reputation. perfect role model for women’s rights as she holds her head up high in her first bucking steer ride at the rodeo, then proving a few years later that she could be one of Montana’s famous cowgirls, a wife, and a mom. I recommend this novel to all reader’s who enjoy a great western adventure as they step out of city life, and jump into Montana’s big sky in the pastures, and hills. Heidi M. Thomas paints a picture perfect “Little House On The Prairie” setting as you learn about riding, and roping steers. The reader can smell the warm cow pie, while visualizing how life is lived on a ranch. The author’s western story comes to life as the reader imagines the milking of cows, churning butter, and chicken chasing. The plot is realistic as Nettie continues to rebel, and life on the ranch may have been more simple back then, but daily chores were tough. The story becomes heart-wrenching and emotional when Nettie faces the loss of her baby sister, ignores her mother’s request, and battles with all the storms through the journey of her dream. What happens when she falls in love with Jake? Will she be a famous cowgirl, or the boring housewife that she dreads to become? How does life change during the influenza epidemic? Will Nettie always ache in pain for love and acceptance from her family? Does she prove that her dreams only belong to her? Family history becomes a constant shifting of drama in a world of tradition as one woman dares to break the rules. ERIN BROCKOVICH, and as entertaining as THE HORSE WHISPERER with Robert Redford. The rangy, reddish-brown steer stared into Nettie Brady’s eyes for just a second. For those readers of westerns, this book is no bull even though it starts with the vision of one. It was hard enough being a female in an all male world of the 1920’s, but to also want to be a rodeo star was downright ludicrous. Nettie Brady wanted to do just that. Heidi Thomas shows us the world of the cowboy in the first part of last century and she does so brilliantly. It’s bad enough wearing jeans and not a dress, but to want to be a bull rider? Hah! The question is, can she do it? Cowgirl Dreams is more than a dream, it is a reality for Heidi Thomas and it will open the eyes of all that read this. “Cowgirl Dreams” by Heidi M. Thomas is beautifully written. It takes the reader into Big Sky country on the back of a strong horse flying over the rugged terrain. I felt that I was there with Nettie experiencing her life and adventures. The descriptions are vivid, detailed, and heart breakingly real as evidenced in the story of little baby Esther. The rodeos and bronc busting found me holding my breath. Nettie overcomes many obstacles to achieve her dreams. This book not only puts you on the back of a horse with her, but also in the kitchen and in the barn or at the rodeo where we watch other women becoming real cowgirls, too. I’m looking forward to the sequel. This author joins the ranks of other Montana writers such as Ivan Doig and Norman McLean. Well done! Heidi has truly captured the heart of the early days of Montana. 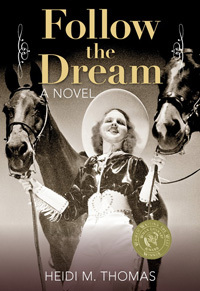 She brings to life Nettie and her dreams for the rodeo despite the opposition of a woman in an exclusive man’s arena. As I read this authors first novel it was a sweet reminder of the Jan Karon Mitford series. I look forward to reading the sequel in what appears to be a Montana series in the making! Some girls claim they were born as horses and only later grew up to be western women. Heidi Thomas gives us one of those passionate, persistent young women in Nettie Brady, and she s based this sparkling and enduring character on her own grandmother s story. Cowgirl Dreams is a heart-warming read for all ages and lets us all know why Ms. Thomas is not only a fine editor of other author s books but shines as a skilled and compassionate writer herself. Jane Kirkpatrick, Award Winning author of A Sweetness to the Soul (Wrangler Award, 1995) and A Tendering in the Storm, winner of a WILLA Literary Award, 2008.